After living in Japan, I think that one of the most creative things I love to do, is to make sushi. My husband is the nigiri-master, but I make one hell of a good maki roll! I love to experiment with the contents, there is so much you can do! Plus, sushi making is the best way to introduce kids to healthy vegetables as everything looks colorful and is fun to make as well. 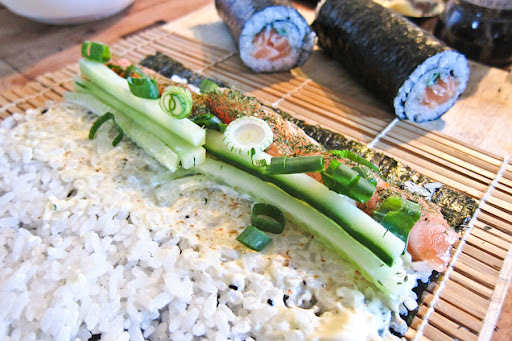 Yesterday night I made a Swedish midsummer style maki- salmon, dill, mayonnaise, spring onions and cucumber. Sushi is so much easier to make than what people think. 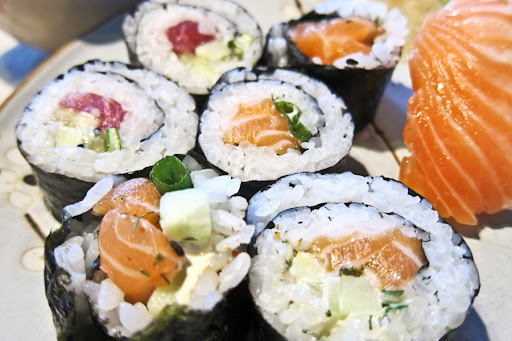 The trick is to find good REAL sushi rice and fresh and juicy sweet fish. The best is to get a rice cooker, and any fish will do as long as it has beautiful color, smells good and clean, like the sea (if it smells “fish”, it’s not good). The color of the tuna should be bright red! If it has any kind of brown stains or shifting in coral green, discard it. Sushi update 2014: Study after study shows how the fish in the seas are disappearing (and how we might not have ANY fish left as early as the year 2050 if fishing continues like it does today)! 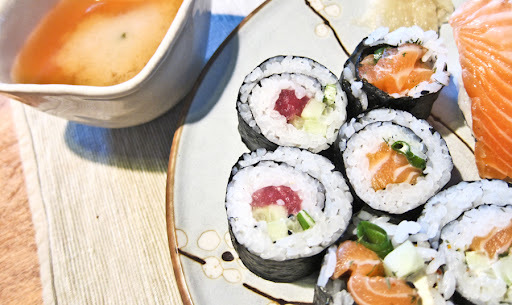 Because of this horrible fact, we have stopped eating our beloved sushi on a regular basis… Instead we replace the fish with vegetables as carrots, cucumber, leeks, avocado and we eat it with a healthy seaweed based miso soup. We do however treat ourselves a small piece of salmon once or twice per year, if the occasion calls for it, but only if we know that it has been caught eco-friendly.